Growth form: Perennial herb or shrublet. Flowering. Mar. Status: Native. Local. 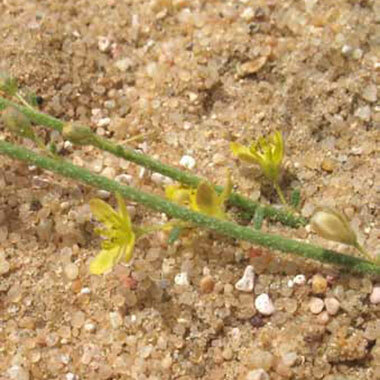 First record: SW Qatar, March 2007 (John Norton and S. Aspinall). Also recorded: E Saudi Arabia, UAE. Habitat & distribution: In moderately firm sand mixed with gravel, and similar habitats. A species also of stable sand dunes in some other parts of the Gulf. Uses: ‘Of some importance for grazing in more remote regions’ (Mandaville).